Claims by plaintiffs in Benicar GI side effects lawsuits have recently been given support by a French study that was presented this past June at Digestive Disease Week in Chicago. The study brings to light just how great an impact using the blood pressure medication Benicar for a long term can have on a patient’s digestive problems. The French Benicar study reviewed more than 4.5 million patients, treated over a 6-year span from 2007-2012. The study was conducted by researchers from the University of Paris and the French Health Insurance Fund. The researchers concluded that using Benicar (olmesartan) for 1-2 years increased the risk of being hospitalized for intestinal malabsorption by more than 3 times; patients who used Benicar for two years or more faced a 10-fold greater chance of being hospitalized for related digestive problems. A Columbia University gastroenterologist found the French study’s link between olmesartan and celiac-like symptoms “robust”. Since February 2014, plaintiffs have been filing Benicar injury lawsuits over gastrointestinal complications caused by the popular hypertension medication. In many cases, the symptoms can mimic, and are misdiagnosed as, celiac disease. Celiac disease, considered widely under-diagnosed in the past, has become more readily diagnosed in recent years. In the classic celiac case – believed to be a type of autoimmune response to gluten, the protein found in wheat – the patient is placed on a gluten free die and then symptoms typically disappear. But olmesartan patients typically do not see improvement in symptoms until they cease taking the drug. The link between Benicar and celiac symptoms was initially noted by Dr. James Murray, a Mayo Clinic doctor specializing in treating patients with severe and life-threatening celiac symptoms. Dr. Murray noticed that nearly two dozen of his celiac patients were taking Benicar and 14 of the patients were hospitalized due to the severity of their symptoms. Unlike most celiac patients, Dr. Murray’s Benicar patients did not improve when switched to a gluten-free diet. The reported GI symptoms were extreme – his Benicar patients lost, on average, 40 pounds, with one patient losing 125 pounds. In July 2013, the U.S. Food and Drug Administration (FDA) issued a warning about celiac-mimicking gastrointestinal side effects cased by Benicar. It required that the manufacturer change its label to warn consumers that taking Benicar can cause what is known as sprue-like enteropathy. 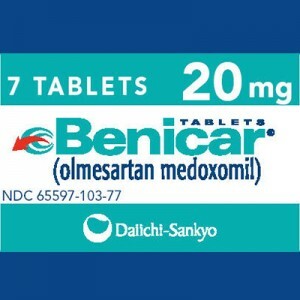 In some cases the symptoms may not begin until months or years after a patient starts taking Benicar. Olmesartan is an angiotensin II receptor blocker (ARB) – it prevents an increase in blood pressure by blocking the action of the substance angiotensin II. There are several ARBs on the market but Benicar is the only one associated with severe gastrointestinal side effects. Some experts believe that because the severe GI effects are only seen in Benicar patients and not other ARB patients, there may be an allergic response to something in the drug.